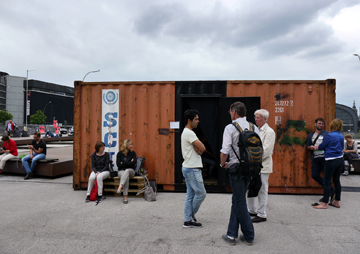 Ein Container ist auf dem Arno-Schmidt-Platz vor der Zentralbibliothek Hamburg aufgestellt. 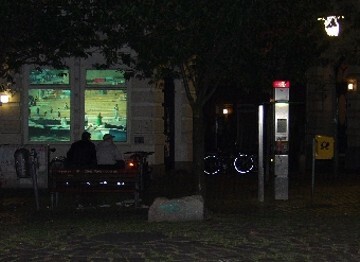 Eine Türöffnung in der Längsseite führt in das bewegte Halbdunkel einer Videoprojektion. Stimmen sind zu hören: von Personen, die zur Kamera blicken und von ihren Erfahrungen in Deutschland, ihren aktuellen Befürchtungen und Hoffnungen sprechen. Was die einzelnen Sprechenden vereint, ist, dass sie geflohen sind, schon vor Jahrzehnten oder erst vor wenigen Monaten – mit Deutschland als Zielpunkt oder Übergangszone. Krieg und Tod, politische Verfolgung, Folter und Entrechtung werden eher angedeutet, ebenso die Wechselfälle der Flucht. Die nacheinander präsentierten einzelnen Erzählungen kreisen vielmehr um den Ort eines Jetzt in individueller Zustandsbestimmung. Demolitions are spectacles many passers-by can not drag themselves away from. 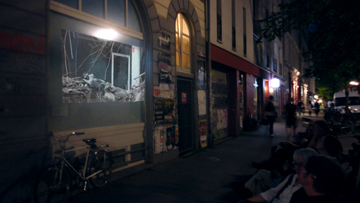 The video-and audio-installation “demo_lition” uses film-material of demolition sites in Hamburg and interviews with people involved to make you think that tiny bit further. 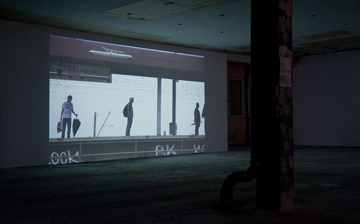 Dorothea Carl uses her filmic long-term observations to capture the rough beauty of a remote urban space and the movements of its users. She turns a place of temporary stop-overs into a lively catwalk of the everyday. 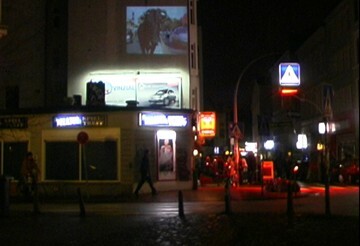 In her film pedestrians of all nations and religions who live on the Elbinseln and the Veddel turn into flaneurs. 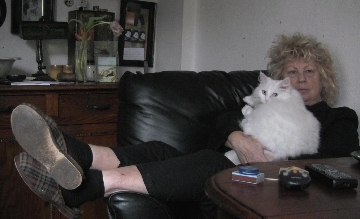 Each woman, man, youngster and child who strolls or runs to catch a train to Hamburg’s center or to Harburg turns into a protagonist of the film. Each person entering the scene provides a new story within these filmic observations. Their stories are neither told nor commented on but they become visible in the small gestures and movements that can be read from afar. Set against a white canvas, women of various ethnic backgrounds give intimate insights into their lives in present day Germany. Their biographies differ strongly: some of them came as refugees, others have parents who came to Germany to study or work. In-between worlds focuses on the daily conflicts and balancing acts these women face within a multicultural society. In doing so, the film scrutinises the very idea of it. A survey on human behaviour using animalistic humanization. Emotional highlights of various Animal-Soap-Sequences on TV. 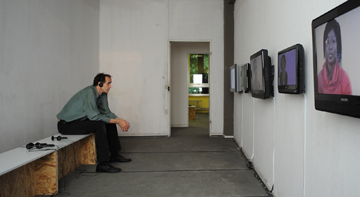 The people who are watching the sequences are shown in a mirrored projection. Images from behind the scene tend to differ from the official coverage of the football world championship: the public places after the celebrations, national symbols out of context, empty streets. A film with statements from: Residents, sanitation workers, T-Shirt and fan article retailers, tickets vendors, healthfood and flowershop owners, a waitress, an artist, a showmaker, a teacher, a therapist, a retired lady, a hairdresser and totally normal football fans. On daily life that happens between the constructions and deconstructions of fun fairs such as the “Dom.”’ On growth of their temporary dwellings and the alternating neighbors who know each other inside out. 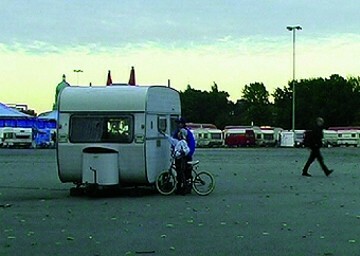 Peeping through the windows of their caravans, the fun fair actors tell stories about their lives and mobile domiciles.